In December 1775, Cletus Moyer, (Avery Brooks), is a free black Northerner in colonial America, helping slaves escape captivity. In the days just prior to Christmas, a group of bounty hunters led by Hattie Carraway, (Kate Mulgrew), captures Moyer. Because of his capture, dozens of slaves who have already left their plantations are in danger of being captured as well. Cletus Moyer implores two slaves from a nearby plantation to take his place: Kunta Kinte, (LeVar Burton), a Mandinka in his mid-twenties who was captured in what is now called The Gambia, a country in West Africa, and Fiddler, (Louis Gossett Jr.), an elderly man who was born into slavery. Kunta is eager to help (and to escape himself), but Fiddler is unwilling, fearful of the consequences if they are caught. Roots: The Saga of An American Family traced a black family from Africa to America and was based, Mr. Haley said, on his own ancestors, whose history and background he researched for many years. 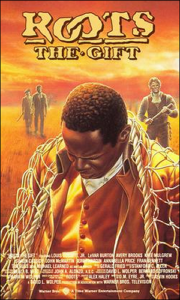 Roots: The Next Generations was the sequel that began shortly after the end of the Civil War, up to the 1970s when Alex Haley was researching and writing his earth-shattering family story. Roots: The Gift features two key characters from Roots and the actors who played them: Fiddler, the seasoned plantation slave (Louis Gossett Jr.) and his young friend Kunta Kinte, (LeVar Burton), who is determined to be free. In this moving tale, they both get involved with a group of slaves who plot a break for freedom on Christmas Eve. “Kunta Kinte was my great-great-great-great-grandfather,” Mr. Haley said, and he was a slave in the late 1700’s. Christmas Eve 1775. For the celebrants at Parker Plantation, it’s a time of joy and giving. For enslaved friends Fiddler and Kunta Kinte, it’s a chance to give to other slaves the most precious gift of all: freedom. Together, they both help an already freed black man Cletus Moyer (Avery Brooks) smuggle runaway slaves to freedom. Roots: The Gift was set during Christmas of 1775 because it was slated for telecast during the Christmas season of 1988—December 11, to be exact. This telecast was timed to coincide with the posthumous publication of Alex Haley’s book A Different Kind of Christmas, which had nothing whatsoever to do with Roots but did concern itself with runaway slaves at Yuletide. • Shaun Cassidy – Edmund Parker, Jr.
• John McMartin – Edmund Parker, Sr.